As awesome as the video below is, I’d strongly recommend not watching it if you are prone to seizures. Or know anyone who is. Or if you’ve even heard the word “seizure” before. So, what are your Halloween plans? My plans tonight have consisted of watching clips of Disney movies in other languages on youtube (thought Robin Hood couldn’t get any better? Watch it in Hebrew. ), hiding in the living room with my family so we don’t have to give out candy to non-dressed up teenage trick-or-treaters, and eating lots of candy. Who needs a Halloween party when you have my life? My neighborhood usually does trick-or-treating a few days before the 31st. Mainly so we can all dodge the creepy old people from other neighborhoods trying to get free candy, but mainly because with the exception of 2 other kids, my siblings and I are the only kids in the entire neighborhood. 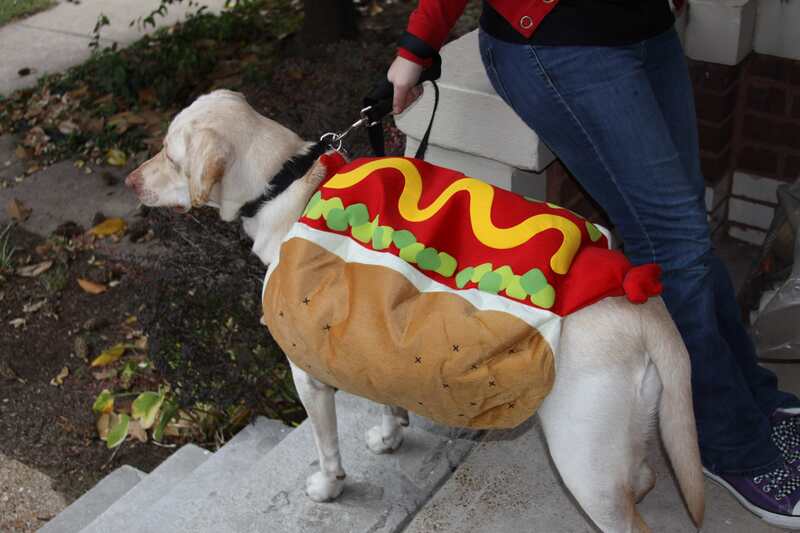 So Halloween is basically Picco and her siblings walking around and getting candy. Luckily pretty much everyone in the neighborhood adores us, so it’s all good. 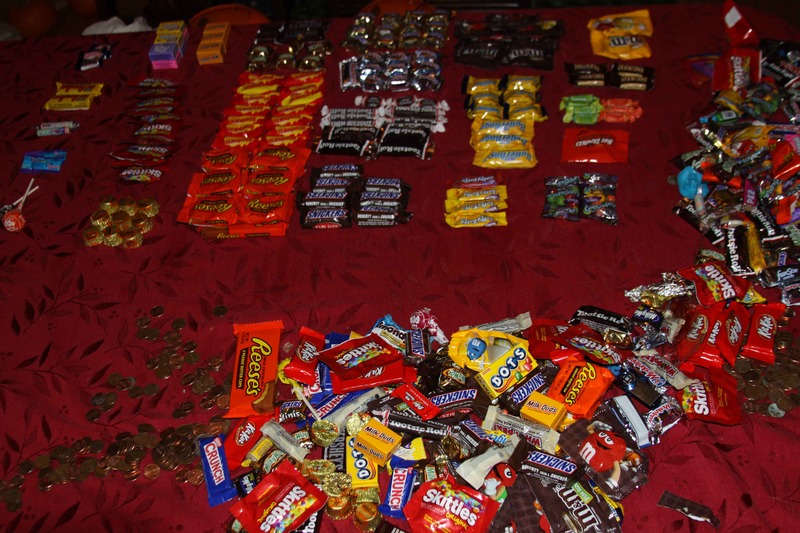 Speaking of candy, guess how much candy my family accumulated last night? Guess a ridiculous number…and then multiply it by 6.
Who wants to see my dog? Friday the 28th. Kind of like Friday the 13th, but…not. In my humble-ish opinion, the best part of the party was the food. Probably because I made all of it and I felt so proud of myself. There’s nothing better than being happy with yourself and then eating food. Fact. 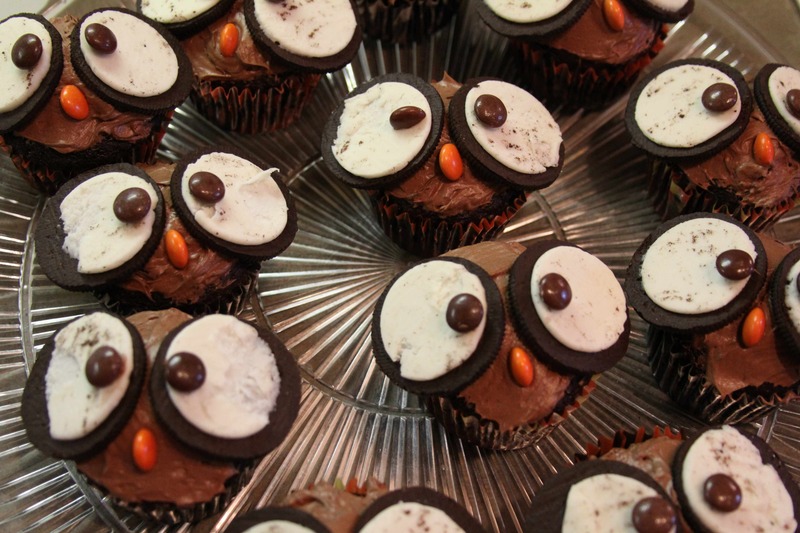 Owl cupcakes=adorable. I totally thought of Mara when I made these. That girl makes me want to love owls, instead of be totally weirded out by them like I am now. 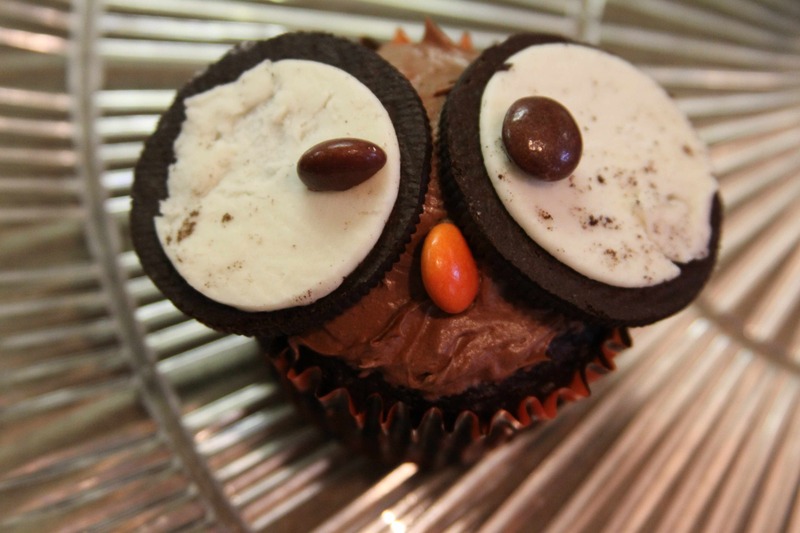 Owls, creepy dolls, and water are the top three things on Picco’s I-don’t-like list. Oh, and I also don’t like Leonardo DiCaprio, but every time I say that people are like *GASP* what?! And then they ask why and I can never pinpoint a specific reason why I don’t like him. I think it’s his creepy eyes. And the moral of that story is don’t hate on Leo unless you want to be shunned by society. I’ve found that out the hard way. 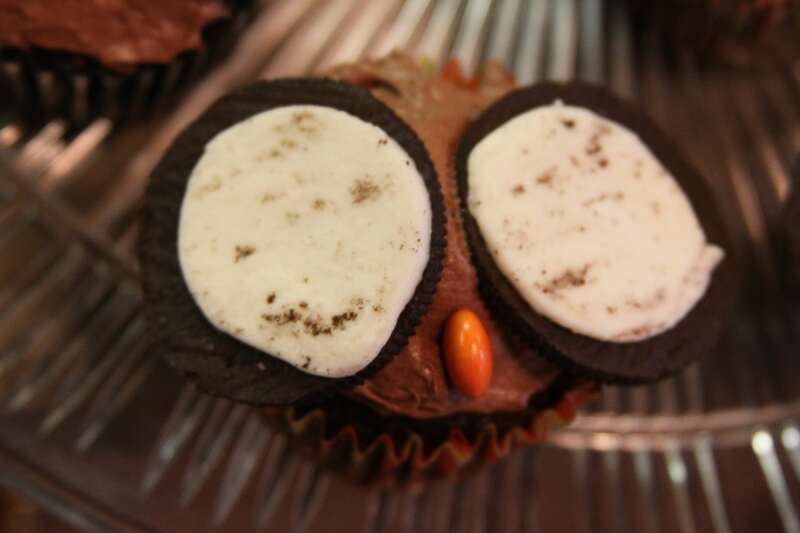 And yes, that owl is winking. 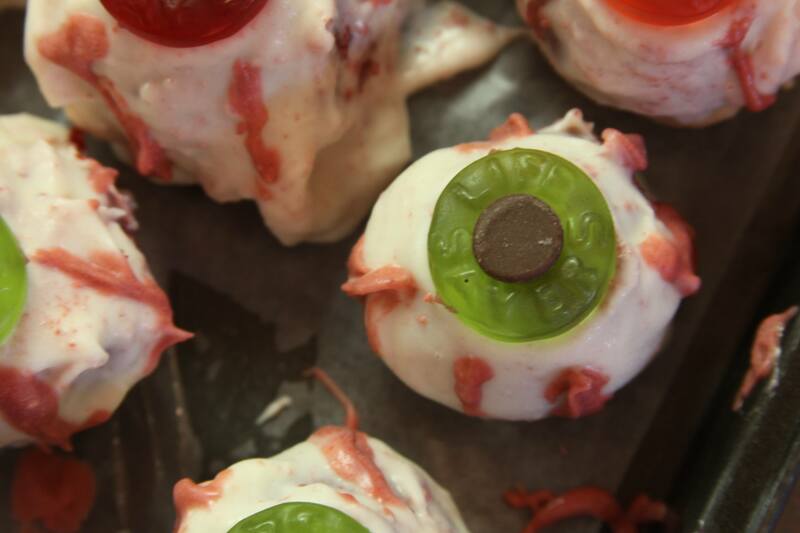 I also made eyeball cake balls. Red velvet cake, an entire can of cream cheese frosting, vanilla almond bark, life savers, and chocolate chips? Um hello, yum. Oh and Tia, I thought of you when I was putting the green life savers on. I was just thinking of all sorts of random people when I was making food, huh? 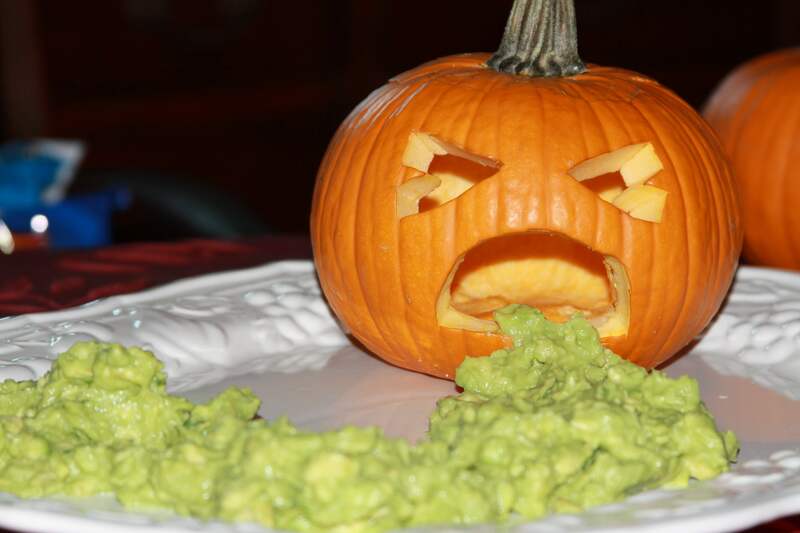 What’s more awesome than a pumpkin puking guacamole? Nothing. 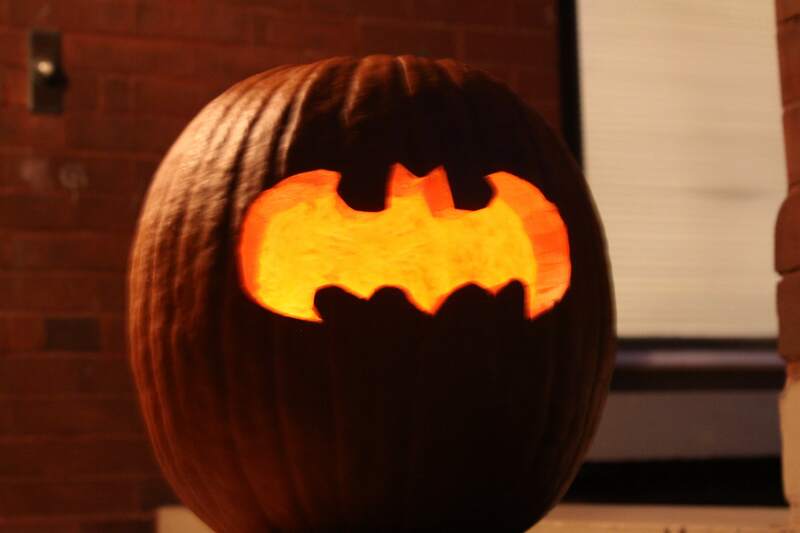 And that pumpkin was the first one I’ve ever carved by myself :) I impress myself sometimes. 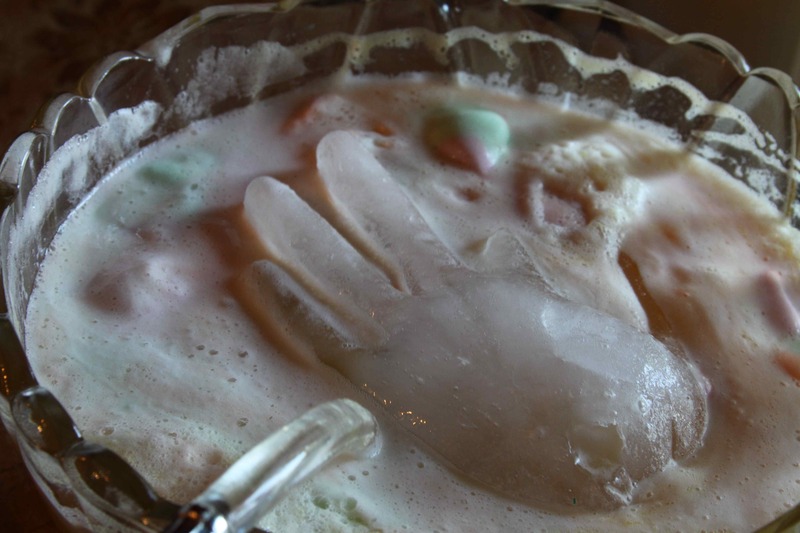 I can’t think of anything to say about this other than uhhh, here’s an ice hand. 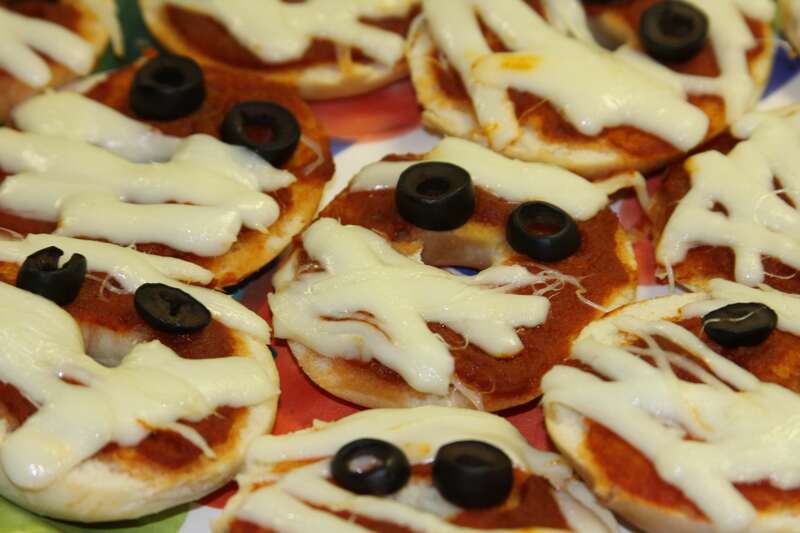 The best part is that I totally didn’t steal all of the food ideas from Pinterest. Nope, they were all totally my own. Because I’m just so creative like that. And now it’s time for Nightmares with Picco. How do you say “what up, home skillet” in French? So, here I am. Watching the baseball game (GO CARDINALS), and realizing I need to sort out my priorities. I mean, I had time Saturday to spend 8 hours with my friend and the two French exchange students staying at her house, but I don’t have time to blog? Pathetic. In my defense, I enjoy being with two 16 year old French boys much more than I like finding a recipe, getting out all the ingredients for it, cooking, cleaning, and eating. Well, maybe I like eating more. But you can’t ask food how to say “Please stop talking. You’re embarrassing me.” in French. Not that I asked the them. *cough* Cessez s’il vous plaît de parler. Vous m’embarrassez. *cough* But neither of the boys could speak English very well and since my friend only takes Spanish at school, we had to rely on my 2 years of French and Google Translator to communicate. So we spent the entire afternoon playing baseball and teaching each other random words and phrases. For example, ” fou” means “crazy”. It’s my new favorite word. And do you know how hilarious it is to hear a French guy say “What up, home skillet”? Um, it’s amazing. Sadly, when I tried to teach them Yo Mamma’s So Fat jokes, they got confused and said umm…sorry? Oh well. I guess food was made here, but I can’t take credit for it. Partially because my younger brother who has wanted to be a chef ever since he was born micromanaged the entire time. But also because I’m laaaaazzzzyyyy. And there is baseball to watch. 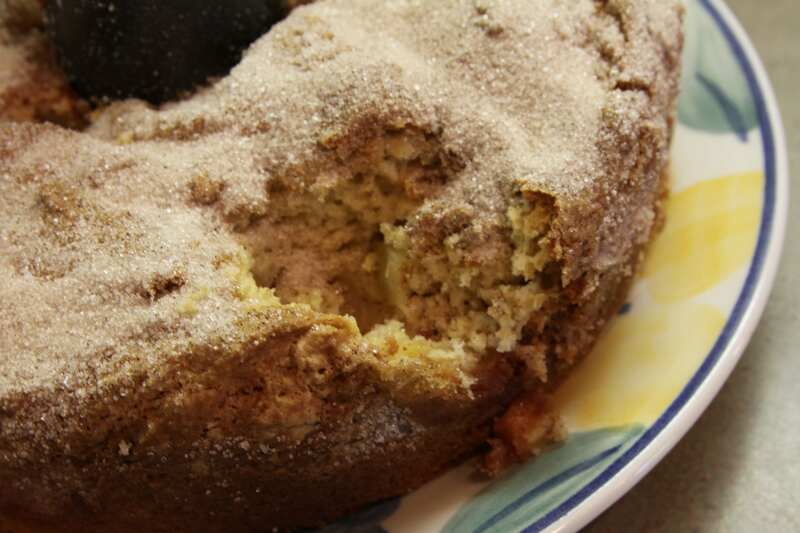 So, my brother and sister made gluten free Coffee Cake yesterday using a recipe from my favorite cookbook/book ever, Gluten-Free Baking Classics by Annalise Roberts. Seriously, if someone wants me to sponsor that cookbook, please let me know. This cake is so amazing that the entire thing was gone by this afternoon. So, who are you cheering for in the World Series? And don’t worry. If you say Rangers, I’ll try not to think you’re totally fou. Adapted from Gluten-Free Baking Classics. Again, I seriously love that cookbook. I demand all Celiacs have a copy in their home. True story. 1. Preheat oven to 350 F. Position rack in center of oven. Grease and flour a 9-inch tube pan with a removable bottom with cooking spray. 3. Peel and core apple; finely chop and set aside. 4. 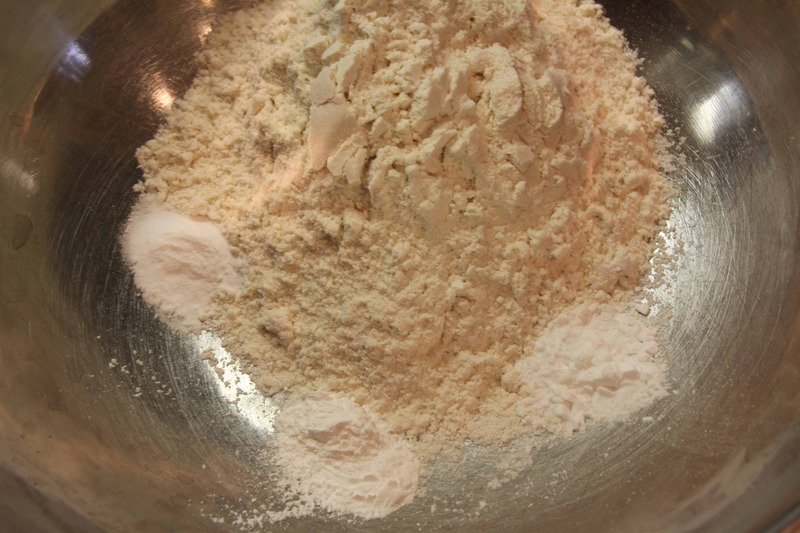 Whisk flour, baking powder, baking soda, xanthan gum, and salt together in a small bowl. Set aside. Surprise? 6. Evenly spread 1/2 of batter into prepared pan. It won’t seem like you have enough batter for 2 layers, but you do. 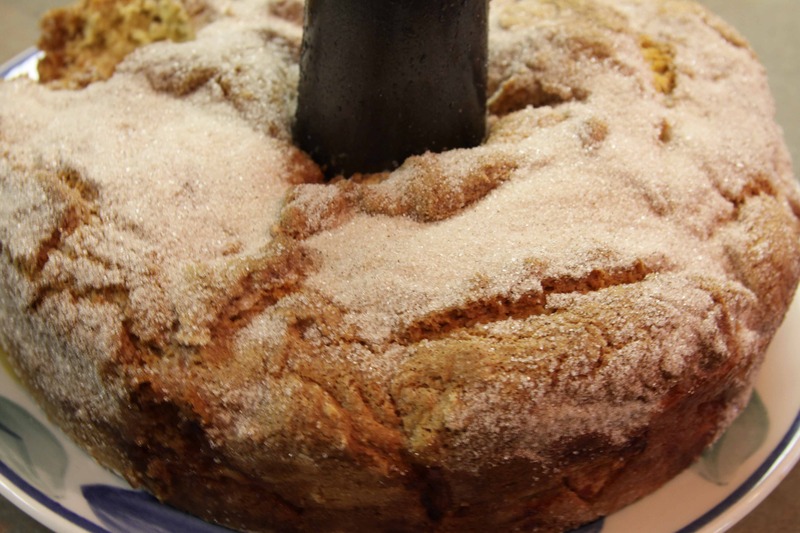 Top with apple pieces and 1/2 of sugar mixture. Evenly spread remaining batter over the top; top with remaining sugar mixture. It’s very, very thin now but no worries, the cake will be several inches thick when it rises. 7. Place in center of oven and bake about 50 minutes or until toothpick inserted in center comes out clean. Don’t open the oven the first 45 minutes of baking. 8. Cool cake in pan on a rack for 20 minutes. Remove sides of pan and cool completely on rack. There are three things that I absolutely love in life: British/Irish people (which I talked about here), food (which I talk about…in every post…), and boys’ choirs (which I’m going to talk about right now). I really, really love boys’ choirs. Like, reeeaaallllyyy love. Although, now that I’m older, it’s kind of creepy for me to go around professing my love for 11 year old boys. Awkward. That being said, guess what I did last night from 8-10? I listened to the beautiful voices of the Westminster Cathedral Choir. And in case you didn’t know, the Westminster choir is all boys. Cute little British boys. And a bunch of them had red hair, which makes them even more awesome. Last night was kind of the best night. Ever. I could seriously talk about the adorable British boys for hours. But that might bore you to tears, so I won’t. See how nice I am? I’m always thinking of you guys and your…uhhh…boredom..? Yeah, my brain is mush today. I’ve been trying to find a good gluten-free chocolate chip recipe. And by trying I mean this is the first and only attempt I’ve made. I know Betty Crocker sells a mix, but how much fun is it to just dump a mixture of flour, artificial flavors and crud into a bowl, add some eggs and oil, and stir? Ok, it’s actually really fun and so wonderfully easy for lazy people like myself, but that’s not the point. The point is that almost every flour mixture I’ve seen (other than the brown rice/potato starch/tapioca flour one I use) involves bean flour. And you haven’t tasted grossness until you’ve tasted Green Bean cookies. 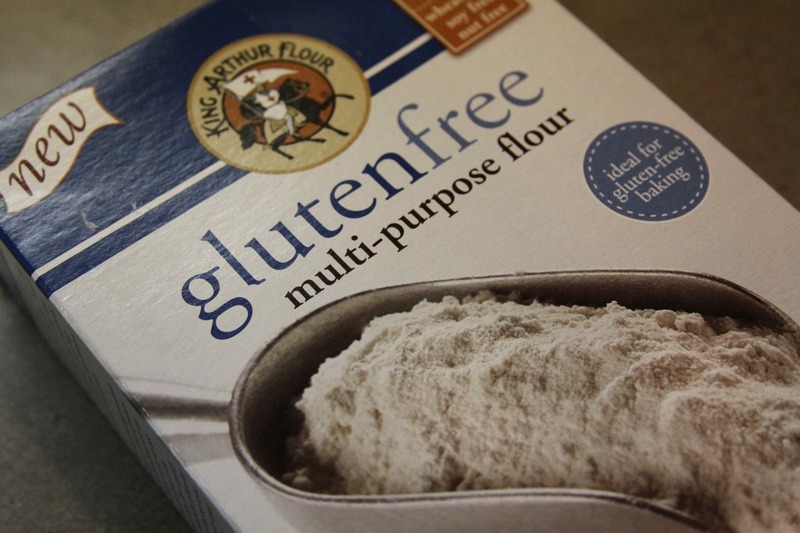 Luckily, I think we’ve found a winner in the gluten-free flour department. And the winner is…King Arthur Multi-Purpose Flour! And no, I don’t love this flour just because King Arthur was British. Ok that might be part of it, but seriously, it’s such a good combination of flours that you can’t tell that it’s gluten-free. Which is always a plus because nothing kills a delicious recipe quite like gritty gluten-free flour that leaves a gross aftertaste in your mouth. Blech. But back to those British boys last night…see?! I can’t stop talking about them. One of the little guys who was probably 8 or 9 hit a high note I couldn’t hit in my wildest dreams. Which really isn’t saying much because my friend told me yesterday that she thinks I should sing bass in our church choir. Are girls even allowed to sing bass? They shouldn’t be. I got depressed just thinking about it. Oh, and I sewed for seven hours today. It. Was. Painful. Seriously, if the state of my brain right now was a word, that word would be a;osdjfasdjf*BALEfs77fsdjfnkjguh^@*$3.14159. But I almost finished my Holly Golightly costume so I’m happy :) But I’m only going to wear it twice, once for my friend’s Halloween party tomorrow and once for my party next week, so I’m sad :( So much sewing for only wearing it twice? Gahhh. But I feel accomplished today. I mean, I made cookies (that were a bit flat. Yummy. 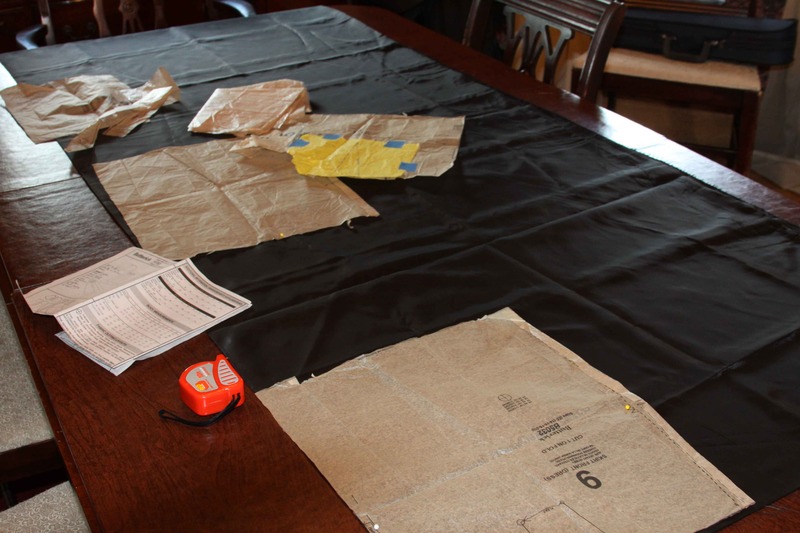 But flat), I sewed, I wrote over 500 words in this post? I’m pretty awesome sometimes. Oh and by the way, if you are British or Irish guy, can sing, are willing to put up with my love of food, and are between the ages of 16 and 24, I am willing to consider your marriage proposal. Lines form to the left. 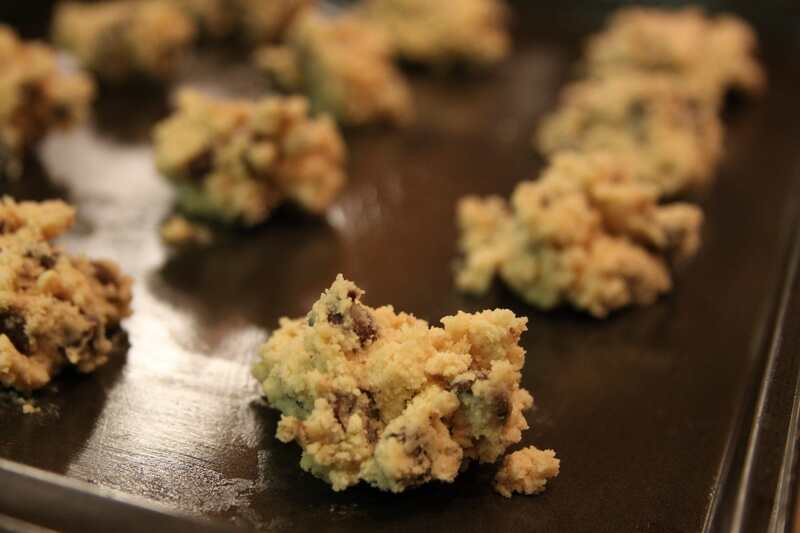 To make sure your oven temperature is exactly right, bake a sample cookie first. 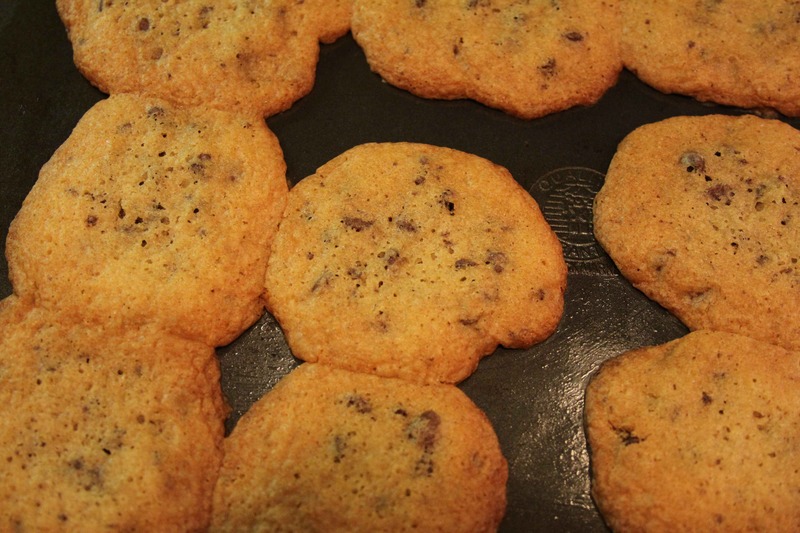 If the cookie spreads too much, raise the oven temperature slightly. If it doesn’t spread enough, lower the oven temperature slightly, or pat the dough down slightly before baking. 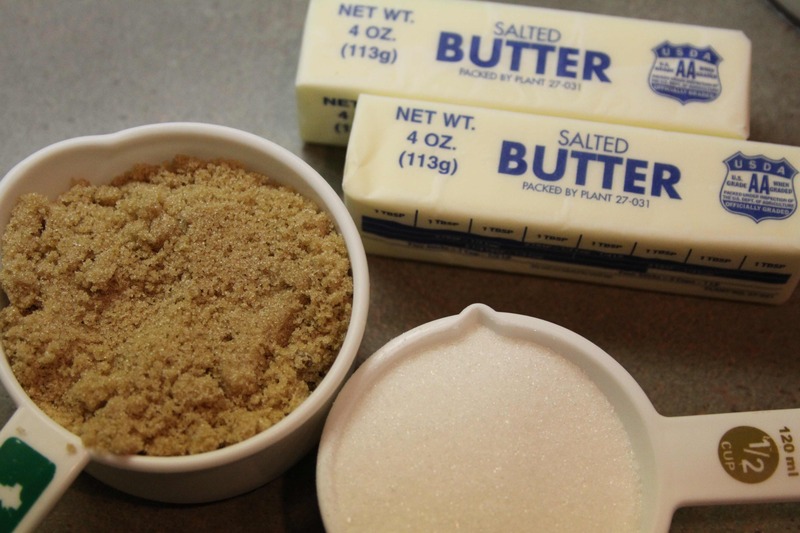 Beat the butter, sugars, vanilla and salt until fluffy. Beat in the eggs one at a time, making sure that everything is well combined. In a separate bowl, whisk together the flour or flour blend, xanthan gum, baking powder, and baking soda. 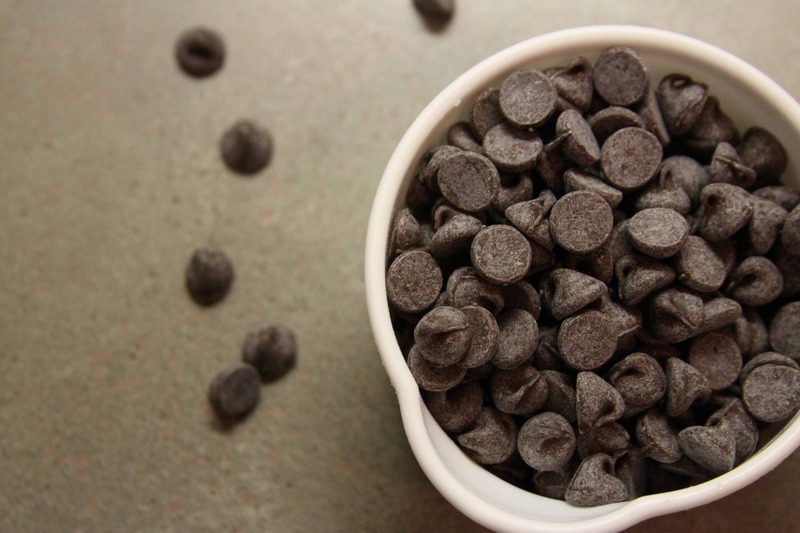 Beat the dry ingredients into the butter mixture, then blend in the chocolate chips. Cover the bowl and refrigerate for 1 hour, or for up to 2 days. While you wait for the cookie dough to firm up in the fridge, I recommend going to see a boyschoir. Or at least watching youtube videos of one. Or having a little boy do a fake British accent. All are adorable. Preheat the oven to 350°F. Lightly grease a couple of baking sheets, or line with parchment paper. 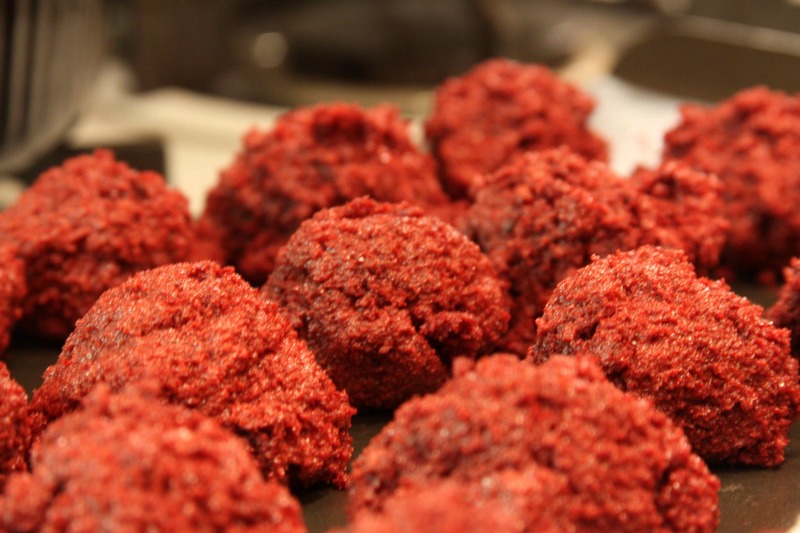 Scoop tablespoon-sized balls of dough onto the prepared baking sheets. Leave space between the cookies so they can spread. 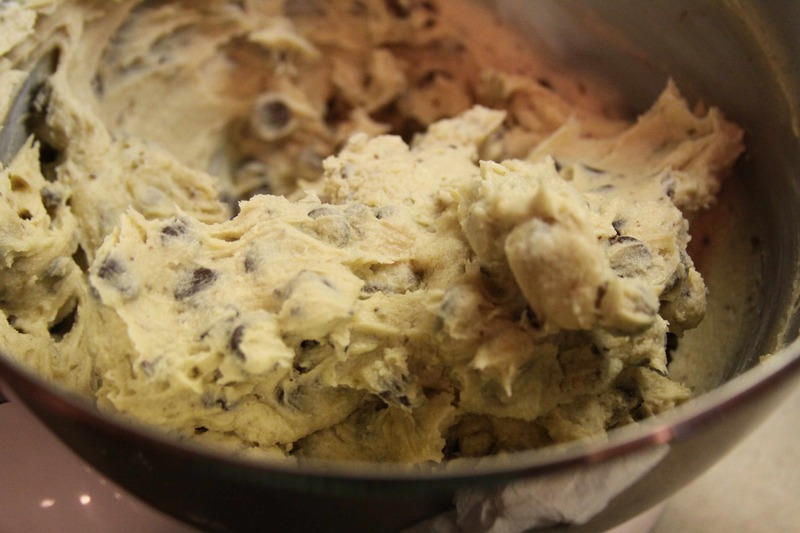 Bake the cookies for 9 to 11 minutes, until golden brown. Remove from the oven and let rest on the baking sheets for 5 minutes, to set, before transferring to racks to cool completely. Or allow them to cool right on the baking sheets. Have you heard of Pinterest? If you haven’t, stop reading this right now and run while you can. It’s so addicting and you’ll waste hours of your life on it. Not that that’s necessarily a bad thing… Pinterest.com is a photo sharing website, but not like flickr. No siree. The pictures on Pinterest are the most creative, wonderful photos of food, food, people, more food, places, Christian Bale, food, clothes and everything. And food. I especially like the food part. When you come across pictures you like, you can “pin” them to your board or, in my case, boards. I have 15 boards and I’ve pinned almost 300 pictures. Actually, if you’re on Pinterest and you want to follow me, click on the “follow me on Pinterest” button on the right side of this page, right below the picture of The Silver Spoon cookbook. But don’t blame me if you spend your entire life on that website. Just sayin’. 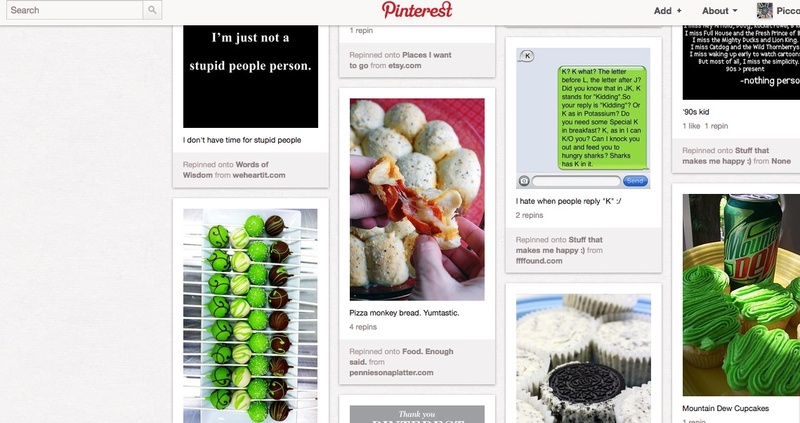 In case you couldn’t tell, one of my favorite parts about Pinterest is the food. I want to make every single piece of food I see pictures of on there. A few days ago I found a picture of cake balls and yesterday I made some. I’ve got to admit, I sort of live under a rock. I didn’t even know what cake balls were until a few weeks ago. And to take it one lamer step further, I didn’t really know what red velvet cake was either. I had no idea it was so…red. Seriously, it looks like blood. Blech. But it tastes amazing, so it’s all good. The first time I had cake balls I was a little confused about why they were a so squishy (for lack of a better word…) in the center. I was thinking it was because they weren’t cooked all the way. Oh was I wrong. 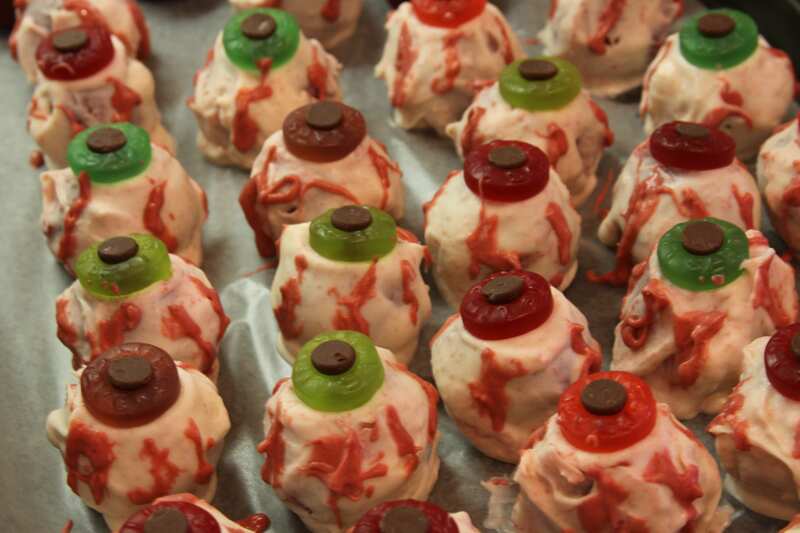 They’re squishy because the cake ball part of it is made up of a crumbled up 9X13 cake and an ENTIRE can of frosting. That’s why. And just when they couldn’t get anymore delicious, you dunk them in chocolate. 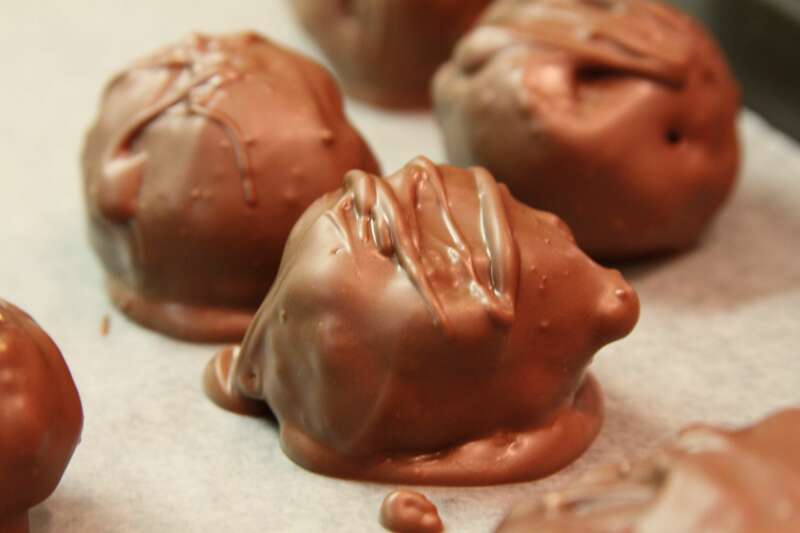 So basically cake balls are pieces of cake-icing and all-with a shell of chocolate covering them. Where have these been my whole life? Speaking of food (when am I not talking about food? Wait. Don’t answer that), do you want know what else I made yesterday? 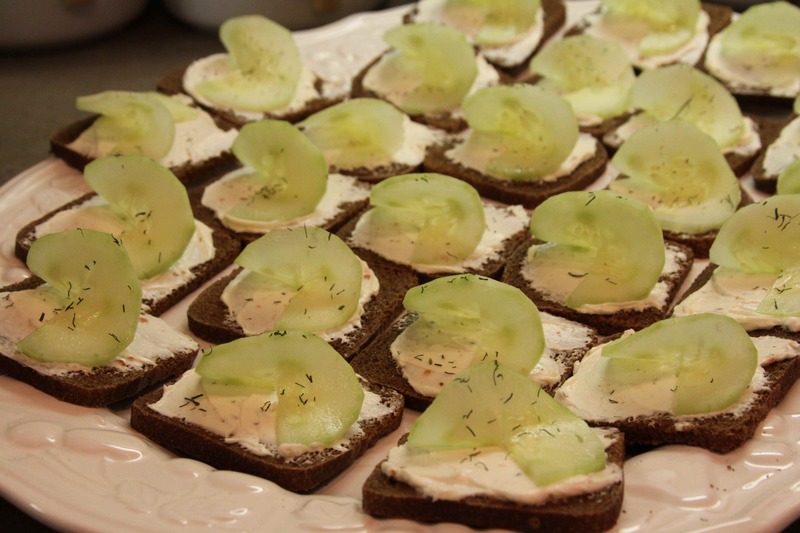 A whole plate full of cucumber and dill toasties. You know what *else* I made yesterday? Part of my Halloween costume. I’m being Holly Golightly from Breakfast at Tiffany’s and I’m making the black dress Audrey Hepburn wears. Yeah, I impress myself sometimes. 2. 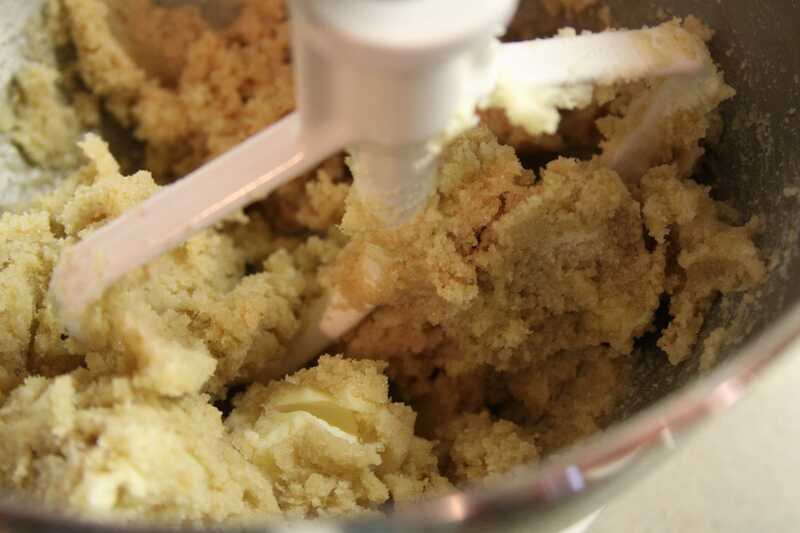 Mix thoroughly with 1 can cream cheese frosting. 3. Roll mixture into quarter size balls and lay on cookie sheet. 4. Chill for several hours in fridge or freezer. 5. 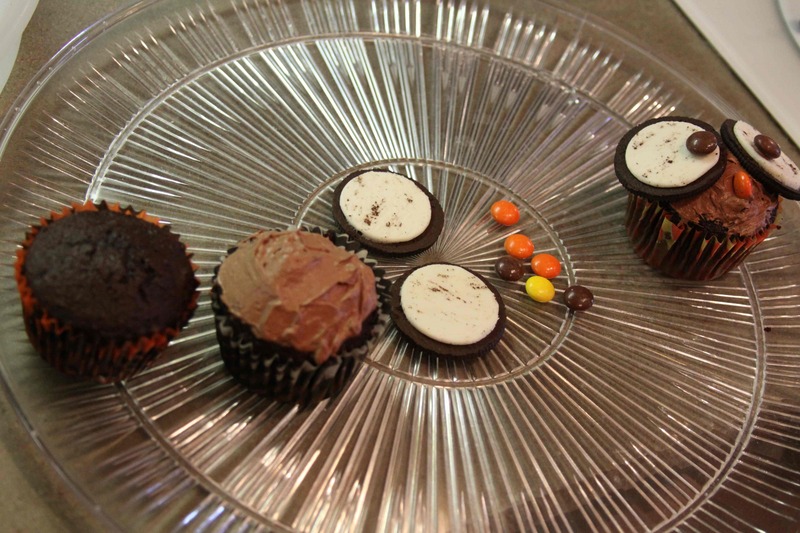 Melt chocolate in microwave per directions on package. 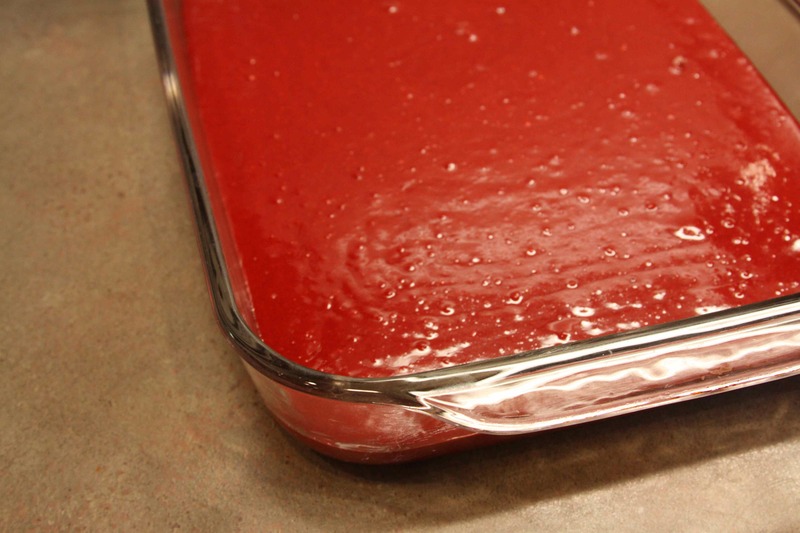 Melt only a few pieces at a time, because the chocolate cools and thickens quickly and it’s hard to work with. 6. 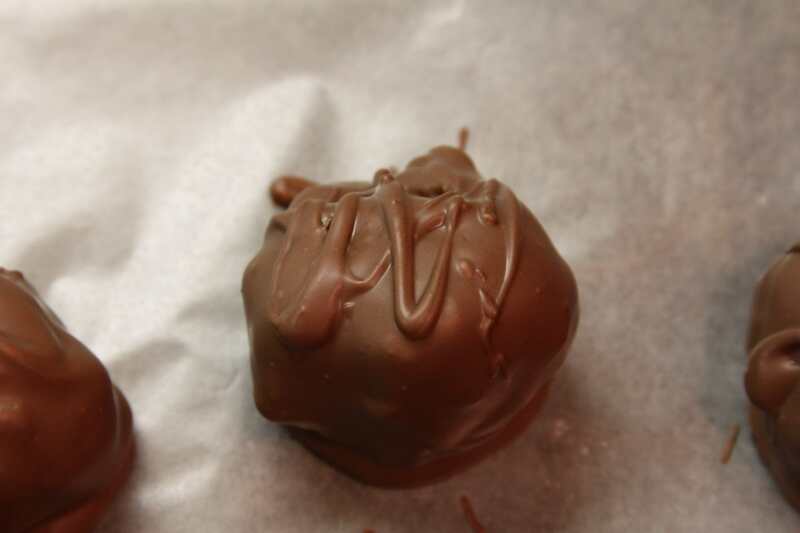 Use a spoon to roll balls in chocolate and lay on wax paper until firm.